We propose as a seasonal dish fresh seafood, prawn garrucha, Mediterranean seafood from the Almeria area. A delicate and subtly sweet flavor. The cooking that we have decided in this case, will be very smooth to respect all the nuances that this product can offer us. It will be a cooking on fata paper, where we will accompany it with a little Amontillado wine, salt and pepper sancho. We will accompany with sweet and acid nuances, very subtle so as not to detract from our main ingredient. Fresh tips of white asparagus that we roast in direct coals with butter of yellow miso, we spread with a cream of light cheese of miso spicy. And a foam of them. 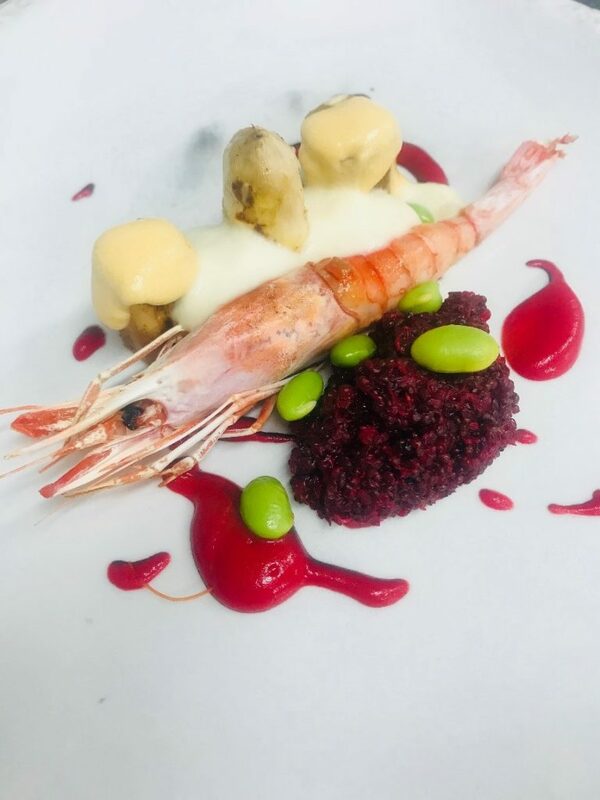 An acidulated tamarillo sauce and red quinoa stew and Tom Yum consommé, a powerful and brutally aromatic consommé that perfectly matches the seafood we present. We ended with some soybeans, edamames, which gave us the crispy, fresh and creamy interior.